Create a library of reusable content and insert it into your posts and pages. Post Snippets v3.0 - coming soon! After a year without an update, Post Snippets will be back under active development! Johan, the original developer, and I have agreed that I will become responsible for Post Snippets. A refreshed and modern user interface. It should allow updating an individual snippet without a page refresh. A fix for the problems some users experience when having hundreds of snippets in one website. For developers: a migration of data to custom post types. If you have questions or suggestions, please email me at diego@greentreelabs.net! 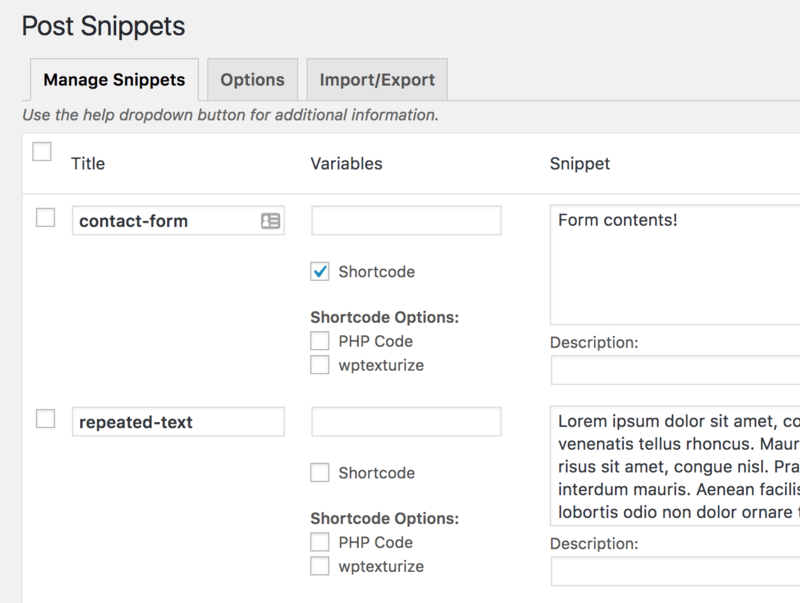 All defined snippets can be inserted with a few clicks from a button directly in the WordPress editor. Snippets can be inserted as defined text, or as a WordPress shortcode for more flexibility. A shortcode snippet can contain PHP code. This allows you to separate PHP code from the other content.